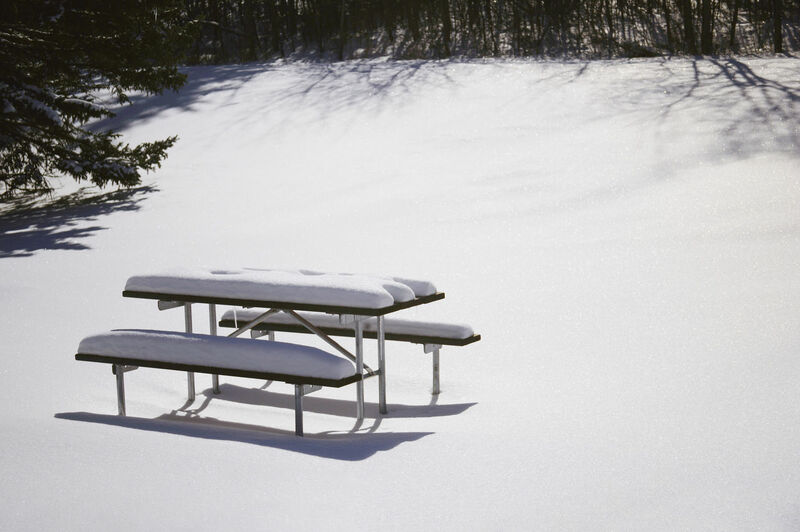 Is it too early to be thinking about picnics and barbecues? I don’t think so. Spring is rapidly approaching, which will then be followed by summer. Do you like to have picnics and cookouts? I love entertaining, and when the weather is nice, Princess Nagger is all about having a picnic. Just eating outside to her is a full-on picnic. Usually I’m scrambling to make sure I have enough plates, cups and silverware when I lose my head and invite scores of people over for fun. Generally I either buy the boring old paper plates, generic plastic silverware and college-kegger plastic cups. But guess what? You can graduate from college kegger mode and entertain in style, thanks to Mozaïk®! 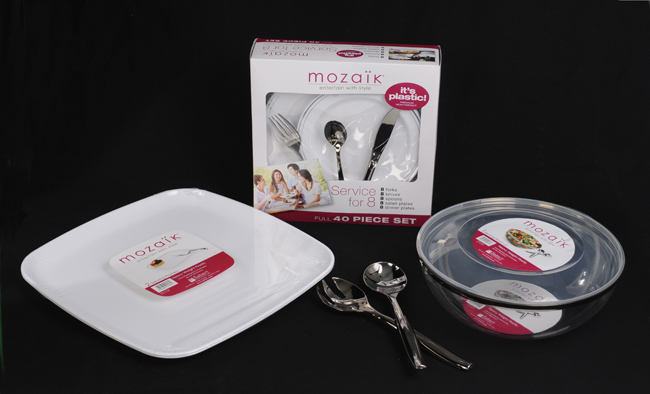 The new “party pack” from Sabert, the Mozaïk® Service for 8 is a full 40 piece set of fashionable, heavyweight plastic plates and utensils that will serve your meal in style. Designed like real china and silverware, Mozaïk® may look like the real thing, but it’s durable, affordable plasticware that you can wash and reuse, or simply dispose. Sure beats regular old paper plates hands down! Designed to look like real permanent ware, Mozaïk is actually plastic party ware that can be washed and reused, or simply disposed of. It provides a fashionable, affordable alternative to paper plates and fine china. Available in both Classic and Contemporary styles, Mozaïk products range from round and square plates, to silver-look cutlery and serving items to mini appetizer ware, creating a nicer impression at any occasion. Mozaïk offers the ease of using disposables without sacrificing style; simply toss the mess for an easier clean up. You can also opt to reuse Mozaïk, just hand wash or place the party ware in the dishwasher on the gentle cycle. The more care they are given the more times you can reuse them. To prove that your table’s appearance can be stylish and sophisticated when you use plastic, Mozaïk expert Jennifer Lucas appeared on WEtv’s Designing Spaces in mid-November to share tips on how to entertain with more style. Visit www.designingspaces.tv to view the segment online. These are perfect for your next get-together – just think, you don’t have to worry about washing dishes when all the guests leave! Definitely affordable – they don’t cost much more than regular old boring paper plates, but oh so much better! Mozaik products can be purchased at Amazon.com as well as CVS and many local grocery stores. Find a store near you! (must be completed before any extra entries are valid) Leave a comment telling me what kind of event you would love to make fancy with Mozaik dinnerware. You have until 11:59pm EDT on March 21, 2011 to enter. 1 lucky winner will be randomly selected. I will email the winner who will have 48 hours to respond to the notification email or a new winner will be chosen. Open to US residents. Good luck! A big thank you to Mozaik for providing me with product for review and giveaway, and to MyBlogSpark for making this review possible. The opinions are of my own personal experience and not influenced by any outside source. Disclosure policy here. This entry was posted in Giveaway, Review and tagged Entertaining, Giveaway, Mozaïk, Review by Stacy (the Random Cool Chick). Bookmark the permalink. I think Easter dinner would be nice to use it. We are having a huge family Easter celebration before husband is deployed. This set would be fabulous for the Easter celebration! The only big dinner I have at my house is Christmas, and I have my hubby & I, my bro & his wife, my oldest daughter so that’s 6 more (sometimes 7 if my oldest grandson brings a GF), oldest son (4), youngest son (5), youngest daughter (3). So, that’s 23? Yes, 23, and on Christmas eve it’s my hubby’s family & that’s Chinese for seven. I subscribe to your e-mail that’s how I found out about this neat give-away! I’d love the set to use for our daughters baptism! My son’s birthday is coming up so this would work great. I would make my sons bday party fancy for the adults!